How we are doing . . . . .
Preparatory work is moving along as concrete is poured for the foundation of the building. It must have been quite a sight as the huge pumping equipment began to pump the concrete from the parking lot to the designated area. In special remembrance . . . . . The construction crew took some time off for a special ceremony, the internment of remains found during the testing process of the church grounds. Presiding over the ceremony was Fr. Lane Akiona, ss.cc., Pastor of St. Augustine Church. Others present were members of the Altar Rosary Society, Staff and guests. 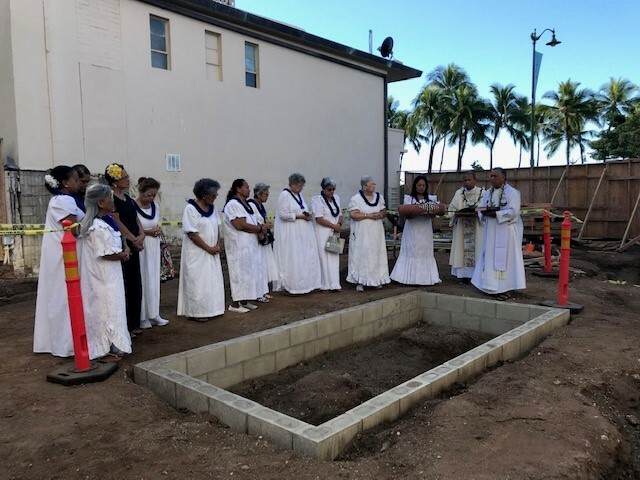 Completion of the Damien and Marianne of Moloka’i Education Center is planned for December 2019. Permits are approved! Initial work to begin November 1, 2018. Reminder: Entrance to the Church will be only from Ohua Avenue. Work area will be closed to walk and car traffic. 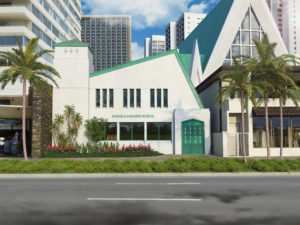 Since the April 15th ground blessing, the project team has been hard at work on the paperwork necessary to build a 6.1 million-dollar project in Waikiki. The project team is busy pouring over details with our General Contractor Honolulu Builders, LLC. A little about our builder, Honolulu Builders was established in 2002 by its principals Dan Jordan and Tom Ryan, the two collectively bring over 50 years of experience in the industry and built over $900 million dollars of in-place construction work. Combined with the extensive experience and professionalism of its management and staff, Honolulu Builders is an excellent partner and we are confident they will deliver to our satisfaction. Since Notice to Proceed (NTP) was issued to Honolulu Builders, they have been engaged in signing up the many subcontractors and suppliers needed to make this project happen. They also have been working hard to get the required submittals approved by Mason Architects and taking care of the many details needed to start building. The project site has been surveyed, and the construction team has been meeting regularly to ensure the project runs smoothly. Look for future updates as we move into site work and foundations in the next few months.